Since one of the worst parts of cleaning is getting rid of the clutter, it’s the best place to start. 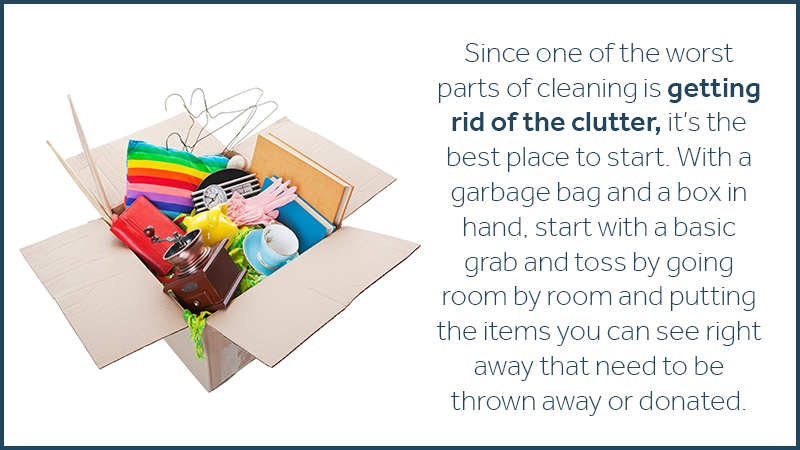 With a garbage bag and a box in hand, start with a basic grab and toss by going room by room and putting the items you can see right away that need to be thrown away or donated. This isn’t the time to do a deep cleaning and decluttering; this step is just to get rid of the excess that is out in plain sight. Do not stop between rooms, just continue to grab and toss until you have gone through every room. The good news: you have already made serious progress and probably feel better! The next step is to going to take a little longer because you will be going deeper with the decluttering, including the attic, basement, garage, and closets. Start with one area and only work in this area until it is completed; choose a place that may not be quite so overwhelming, such as a bedroom closet. You will need a box for trash, a box for donations and a box for items to keep. If you struggle with getting rid of an item, think about the last time it was used; if it has been longer than six months, get rid of it. Only keep the items you love or you use. 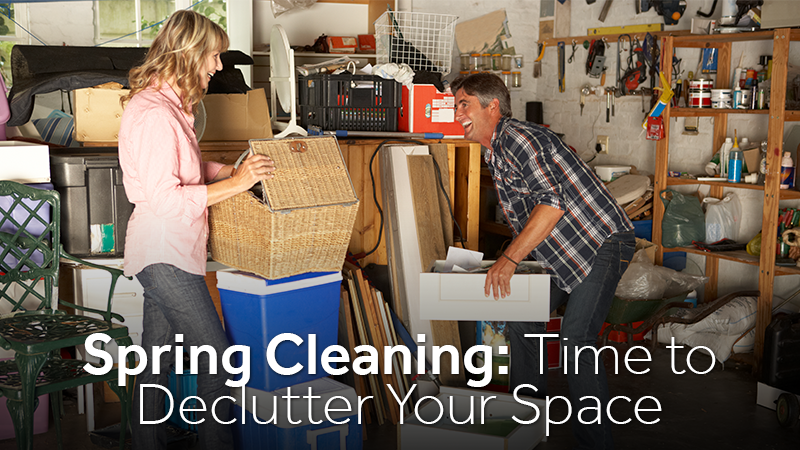 Before moving on to the next area to remove the clutter, clean the area you just finished clearing out. For example, if you just finished emptying out the bedroom closet, before putting the keep items back in the closet use a vacuum to clean the dust and cobwebs from the corners, sweep and mop the floor and wipe down the shelves. Baby steps, friends. Baby steps. Once you have all of the clutter removed from your home, deep cleaning the frequently used areas will be much easier. This is the time to concentrate on areas such as the stove, refrigerator and flooring. When cleaning appliances, remove all movable parts, such as shelves and drawers, and thoroughly wash them before replacing them. If you have carpeting, either rent a steam cleaner or hire a professional company to clean the carpeting, grout and tile. Do not under any circumstance keep the donating items in your home after boxing them up. Keeping these items in arms reach can make it tempting to take a thing or two back out. While you are in the decluttering process, as a box gets full, take it immediately to the car so you can drop them off the next time you have to go out. Be sure to take all of the trash out as soon as you fill a bag and if there is a significant amount of trash, contact the sanitation department to ask about large trash pickup days. Need a place to store those items you don’t want to put back in the house? Sometimes once the decluttering is over, it’s difficult to take anything back in, especially things like seasonal items, toys and lawn equipment. Don’t worry! You can contactZippy Shell of West Houston and we’ll be happy to help you with storage solutions. Happy cleaning!